Joanna was awarded her PhD in Psychology from the University of Stirling in 2004. She is now a Senior Lecturer in Psychology at Glasgow Caledonian University. In addition to her academic teaching position, Joanna has been working on a programme of research devoted to the investigation of social psychological factors in the experience of short and long-term pain, and was among the first investigators to publish research in the area of social justice cognitions in pain, in 2010. Joanna’s research has gained international recognition and she has been invited to speak at national and international conferences. 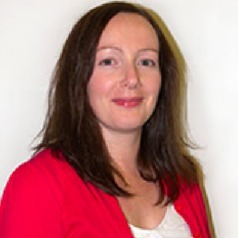 She has attracted funding from various funding bodies as Principal Investigator to work with a range of individuals recruited from the general community, pain clinics, general practices and pain support groups (including those from various socioeconomic backgrounds in Glasgow). She has led numerous projects adopting a range of research methodologies, including questionnaire methodology, interviews, focus groups and Q-methodology, with a focus on analysis techniques including interpretative phenomenological analysis (IPA) and thematic analysis. Joanna’s research is frequently underpinned by community engagement activity where she has consulted a range of stakeholders including major employers in Glasgow, General Practitioners, charitable organizations and chronic pain sufferers in the development and progression of her research, something she believes to be essential to the success of research. Joanna’s research has been published in various high quality journals, including a review published in Current Directions in Psychological Science in 2013.